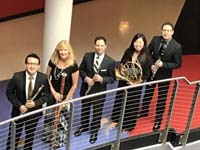 Since its formation in 1976 as ensemble in residence at the University of Akron, Solaris has established a reputation as one of the foremost woodwind quintets in the United States. In addition to their regular concert series at the University of Akron, Solaris has toured Italy, Brazil, Sweden and the United States. Their concerts in the Northeast Ohio area have included Music from Stan Hywet, the Cleveland Art Museum, the Cleveland Composers Guild, the Rocky River Chamber Series, the Baldwin Wallace Conservatory, the Cleveland Institute of Music, Severance Hall, and appearances on public television station WNEO/WEAO and NPR affiliate WCPN in Cleveland. Solaris' performances and recordings have received unanimous critical acclaim. Audiences and critics raved about their recent tours to Florida and Virginia: "The ensemble playing was as impressive as the individual players' mastery of their instruments. Everyone played superbly." (Joe McClellan, music critic emeritus of The Washington Post). Cynthia Cioffari Bassoon Cynthia Cioffari teaches bassoon, coaches chamber music, and is a member of the Solaris Faculty Wi . . .
Stanislav Golovin Clarinet Clarinetist Stanislav Golovin recently joined the faculty of The University of Akron. He is a Gold . . .
Daniel Velasco Flute Daniel Velasco is the flute professor at the University of Akron, a member of the Solaris Quintet, . . .
Margaret Tung Horn Dr. Margaret Tung is the Assistant Professor of Horn at The University of Akron and horn faculty a . . .
Jack Harel Oboe Jack Cozen Harel is Associate Professor of Oboe at the University of Akron. Active as a soloist and . . .